I love gifts that are hand made. For one they are very personal and one of a kind. It also tells me that I was in the person’s thoughts all throughout the creative process. This is the reason why I wanted to make a little hand made gift for my nephew, who is going to turn 5 moths old around the Christmas holidays. I decided to share it, because if you are looking for a last minute gift which is easy to make this could give you an idea. I am deliberately not saying that is is just for a young child, because honestly speaking, I would love one for myself. 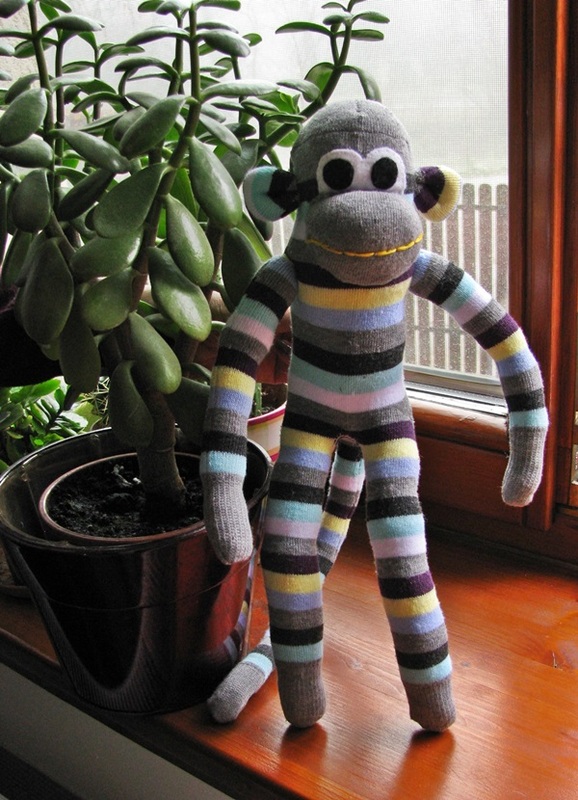 I knew I wanted to make a stuffed animal of sorts for my nephew. I also knew I wanted to make it fun and unique. 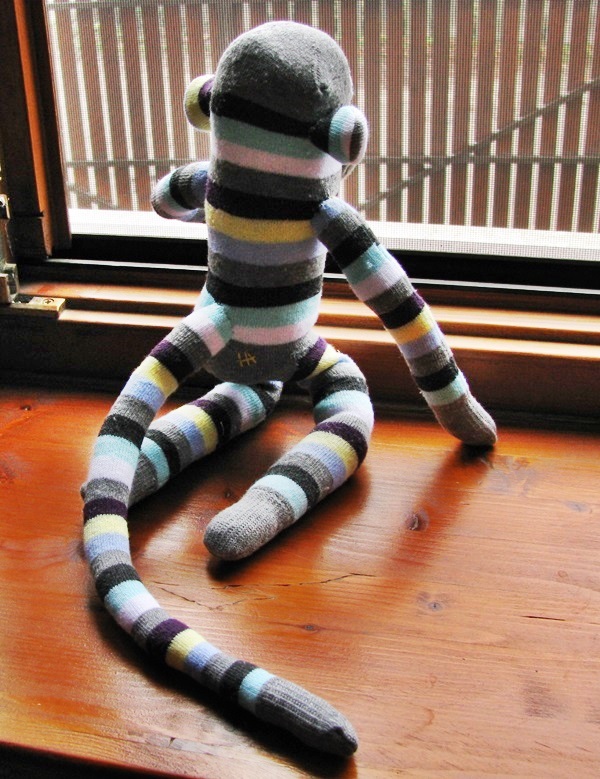 I started looking around and I found a fun sock monkey tutorial on Craft Passion. Once I saw its cute face I was sold instantly! I read through the description and decided it was relatively easy to make, so went for it. Now, to be honest, the most difficult part of this entire tutorial was finding the pair of socks. You might be laughing, but when you want to buy a pair of striped socks it is not so easy to find one. I went to countless shops, looked at many, many pairs, but it was really hard to find the right color combination for a small child. I ended up buying a couple of different ones to see which one I liked at the end. Once I had the sock problem out of the way the rest of the process was much easier. The tutorial is very easy to follow. All the illustrations are to the point and are very helpful. It took me no more than an afternoon from start to finish. A couple of lessons learned if you decide to give it a go. Don’t use socks made of fleecy material, because it will have a tendency to fuzz. When you are sewing the legs, arms and tail use contrasting thread as it will be easier to see where to cut later. I used stuffing material to stuff the tail. Make sure you roll the tail between your palms though (as suggested for the arms) so it will be nice and uniform. 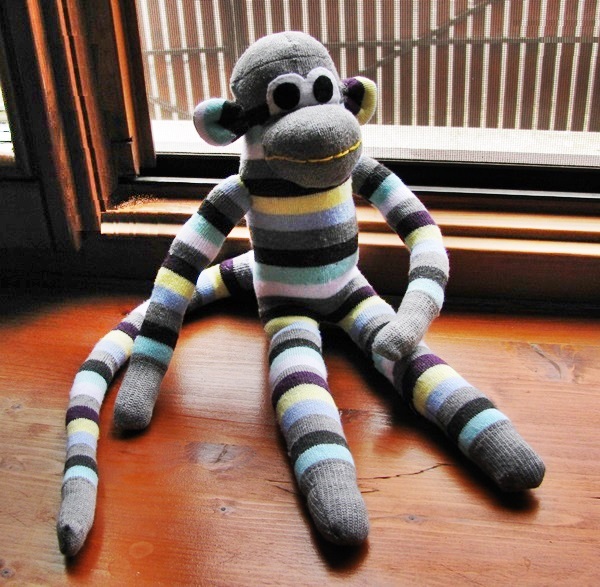 If you are making the little friend for a small child make sure you wash both the socks and the filling material before you start the project. The monkey will be in the little one’s mouth faster than you can say banana. Monkey with baobab plant (if I translate the Hungarian word for baobab to English, it is monkey bread tree). A match made in heaven! Do give it a try, it is so fun!